Employers understand the value of camaraderie among staff. They want their employees to get along and work well together because it increases production. That’s why so many businesses sponsor team-building exercises, workshops and retreats outside of the confines of the office. Team-building exercises don’t have to cost a lot of money, and they don’t need to require that employees suspend themselves from a 200-foot high trees either. In fact, for liability sake, the closer to the ground, the better. Here are three great team-building exercises that are a lot of fun, but don’t pose a lot of risk. Think Pictionary for the big screen. The work group splits into two teams, with each team taking turns. When the first team is up, the designated artist stands at a board, pulls a word or phrase from a hat/bag/box, and within a predetermined time period (say, 2 minutes), does his or best to draw out the word or phrase. Teammates shout out their guesses until time is up. The artist for each team rotates each turn, and the team with the highest score at the end wins. This is a straightforward game that requires just 15-30 coins, keys, pens, or other small objects. 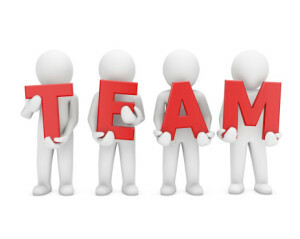 Place the selected items in the center of the group, and divide the group into two or more teams of two or more people each. Each team takes turns removing one, two or three of the objects from the center until only one item remains. The team that is left to remove the last object wins. This is a game of strategy and numbers so be careful when choosing how many items to remove during each turn. An iconic photo, cartoon or painting is chosen secretly by the team leader. The picture is then cut into pieces equal to the number of participants, with each player receiving one piece. Next, each employee is instructed to recreate his or her piece of the puzzle, except it must be drawn on a full-size sheet of blank paper. Since the participants don’t know what the original picture was, they have no way to know how their interpretation will impact the picture as a whole. Once everyone is done, all team players work together to piece their version of the picture together. This activity employs teamwork, and highlights the impact of departmental working. While these exercises may not be as exciting as walking a tightrope or bobsledding with your co-workers, they employ teamwork and can be a lot of fun. They’re also much safer activities for everyone involved. Injuries that result from offsite team-building activities are a legal gray area, and litigation outcomes depend on many factors, including whether or not the action is forced, or perceived that way by the employee. There are indeed differences between voluntary and forced team-building exercises, and how the rules vary by state. More and more employers are requiring liability waivers to be signed, or simply nixing offsite team-building activities altogether. They simply don’t want to take the risk of anyone getting injured and the expense that comes with it. Make sure that your insurance covers premises liability, or you may be in for a surprise, and not in a good way.